KUALA LUMPUR (May 26): Propelled by higher passenger traffic and lower fuel costs, AirAsia Bhd reported a near six-fold jump in net profit for the first quarter ended March 31, 2016 (1QFY16) to RM877.79 million from RM149.33 million a year earlier. Revenue rose 31% to RM1.7 billion from RM1.3 billion, on the back of a 17% growth in the number of passengers carried to 6.48 million from 5.54 million, said the low-cost carrier. The passenger growth was well ahead of the 3% capacity growth, allowing the company to record a high load factor of 85%, it added in a statement. "The positive momentum we have seen for our Malaysian operations has continued well into the current quarter," said its chief executive officer Aireen Omar. "Our improved revenue per available seat kilometres (RASK) proved that low fares stimulate the market as seen by the sustained increase in the number of passengers." Aireen said ancillary revenue as a whole increased 22% with the highest contributor coming from baggage (making up 45% of total ancillary revenue), followed by cargo (9%) and insurance (7%). 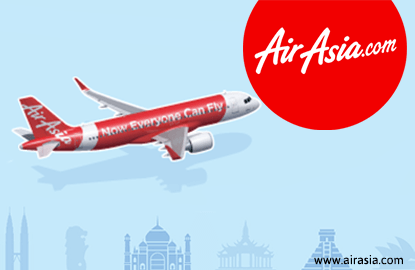 She said the highest growth among its ancillary products were AirAsia Courier, which surged by over 1,000%, sale of inflight merchandise (up 274%), sale of inflight duty free (up 147%) and connecting fees for its 'Fly-Thru' service (up 74%). "These led to the company recording an ancillary income per pax of RM50 this quarter (up 5%), thus achieving our target," she added. AirAsia's Malaysian operations' RASK was up 17% to 16.88 sen, while cost per ASK (CASK) fell 1% to 11.7 sen. But its aircraft operating expenses' doubled to RM111.73 million resulted in its CASK ex-fuel rising 25% to eight sen. Meanwhile, AirAsia's best-performing associate Thai AirAsia (TAA) made an after-tax profit of 1.83 billion baht, an increase of 99% year-on-year. Revenue rose 16% to 8.97 billion baht. Its group chief executive officer Tan Sri Tony Fernandes said TAA's 18% passenger increase in the quarter also led to it record its highest load factor, at 88%, as there was a strong momentum in total tourist arrivals from China and Asean. "This led to a 3% increase in RASK at 1.81 baht (21 sen). Meanwhile, CASK reduced by 6% year-on-year to 1.39 baht due to 25% drop in fuel expenses," said Fernandes. The group's 49%-owned Indonesia AirAsia meanwhile turned itself around with a net profit of 21.95 billion rupiah (RM6.58 million) in the quarter, up 104%, despite a 24% drop in revenue, as it removed additional aircraft from its fleet. Commenting on the group's outlook, Fernandes said: "In Malaysia, we are seeing robust demand despite the weaker consumer sentiment and domestic economy. In addition, the trend of local consumers trading down when going on their travel still persists while foreign nationals are still eyeing Malaysia as a value for money holiday destination due to our weaker currency." He added that demand from Chinese travellers has recovered with a 37% jump in the number of Chinese guests flying into Malaysia during 1QFY16. As for the cost going forward, he said the group's efforts to hedge 75% of its fuel requirements at an average cost of US$55 (RM223.56) per barrel have "paid off", and it is now relatively insulated from global fuel prices' volatility in the coming quarters. AirAsia shares fell by 10 sen or 4.5% apiece to close at RM2.12 today. It has a market capitalisation of RM5.955 billion.